The scammers at Minex scammers are in trouble and panic-mode ! Who can forget this post?? This was another excellent post by thunderjet with lots of background information about how the Minex team are scamming investors but also their inner circle scammer alliance consisting of Temhuk and Racquemis1 along with paid trolls such as Jedgar, yurez83, akira128 and a few others keep up the lies about this Minex Scam to line their own pockets. The complaint has to be made to Upaycard stating that if they do not cancel these cards then you will report them to Mastercard. 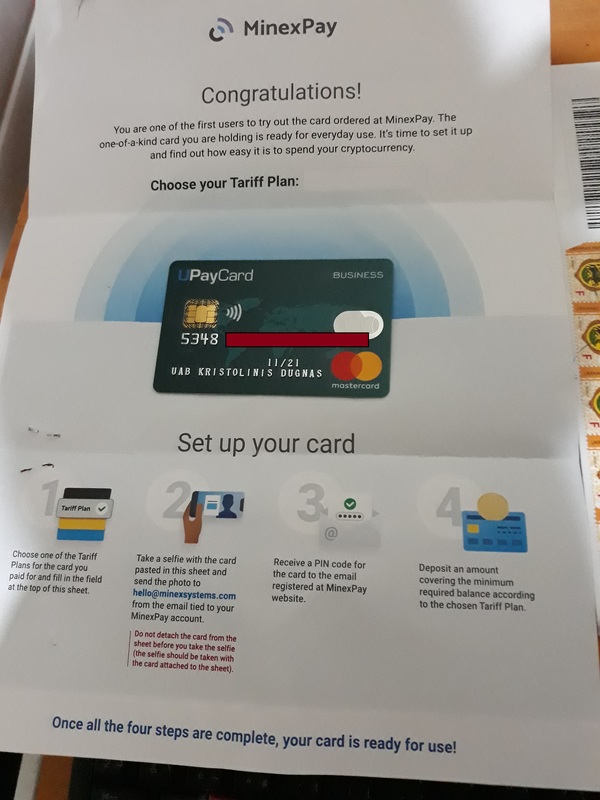 As soon as Upaycard discover Minex scammer are using "UAB KRISTOLINIS DUGNAS" as a front to give out Business cards to people by claiming they are employees and as soon as they are informed of the crypto rules which breach Mastercards own rules then they will probably investigate what is going on at Minex then will cancel all the cards. If they are told that Moorwand Ltd will be reported to Mastercard for breaching they "crypto-FIAT" rules because of the Minex scam then they will definitely pull the plug on this scam. Hell. How dumb you are, Jolly is a crook. Do you think that these business cards will be blocked because they work with Fiat? ? LoLzzz. Troll scammers try to do harm, but if others are warned, it means they are armed. From what service this screenshot was made? I saw that you have also MinexCoin listed in your signature, why did you delete it? And do you think that Republia is also scam? When it is created by MinexCoin team? I never deleted Minexcoin from my signature, it has been there for many months. Minexpay trolls became very nervous,because they cant do anything more to preserve Minexpay/Chain2pay SCAM from complete failure. They cant hide ugly truth about Minexpay/Chain2Pay project. Even locking threads cant help them any more.People is dumping MNX hard and price hit today $0.56. People be careful!!! Yurez 83 went rogue and shamlessly posting non-existing Minexpay branded cards !!! "Card" in his post above is NOT-EXISTING!!! !